GENTLEMAN'S RANCH: 11.441 acres, 3577 sq. ft. main house, 1338 sq. ft. guest house. Entire gated community has a wildlife exemption so owner doesn't pay property taxes on the land, only the structures. Potential HORSE PROPERTY, one animal per every two acres allowed. Hunting is also permitted. Between the two houses there are FIVE GARAGE BAYS! Everything CUSTOM: cabinets, trim, flooring. The second story of the main house has a theater room with a microwave and mini-fridge as well an 800+ sq. ft. bonus room. A large lanai with grilling patio and outdoor fireplace make sitting outdoors and enjoying the beautiful views of this property a treat! A porch swing graces the large wrap-around front porch, another peaceful area to sit and enjoy nature's beauty. A BEAUTIFUL MUST-SEE property for anyone dreaming of Hill Country Living. Only 6 1/2 miles from CANYON LAKE Boat Ramp 23. Courtesy of Patrick Edward McFarland. GENTLEMAN’S RANCH: 11.441 acres, 3577 sq. ft. main house, 1338 sq. ft. guest house. Entire gated community has a wildlife exemption so owner doesn’t pay property taxes on the land, only the structures. Potential HORSE PROPERTY, one animal per every two acres allowed. Hunting is also permitted. Between the two houses there are FIVE GARAGE BAYS! Everything CUSTOM: cabinets, trim, flooring. The second story of the main house has a theater room with a microwave and mini-fridge as well an 800+ sq. ft. bonus room. A large lanai with grilling patio and outdoor fireplace make sitting outdoors and enjoying the beautiful views of this property a treat! A porch swing graces the large wrap-around front porch, another peaceful area to sit and enjoy nature’s beauty. A BEAUTIFUL MUST-SEE property for anyone dreaming of Hill Country Living. Only 6 1/2 miles from CANYON LAKE Boat Ramp 23. 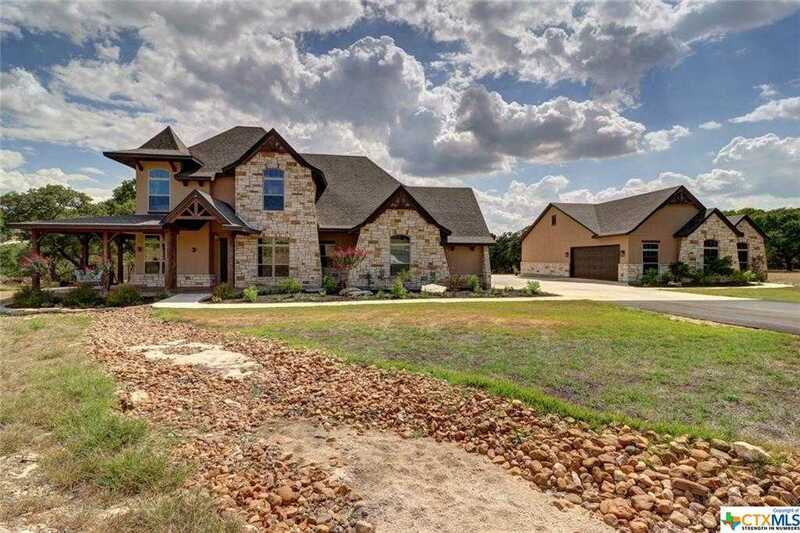 Please, send me more information on this property: MLS# 345426 – $1,000,000 – 1213 Canyon Curve, Spring Branch, TX 78070. I would like to schedule a showing appointment for this property: MLS# 345426 – $1,000,000 – 1213 Canyon Curve, Spring Branch, TX 78070.